This was a really lovely and unusual wedding, starting out with an amazingly romantic wedding aisle framed by such pretty cherry blossom and hydrangea flower trees, and moving on to pretty and informal centrepieces, with a big focus on pretty candlelight and scented lavender. 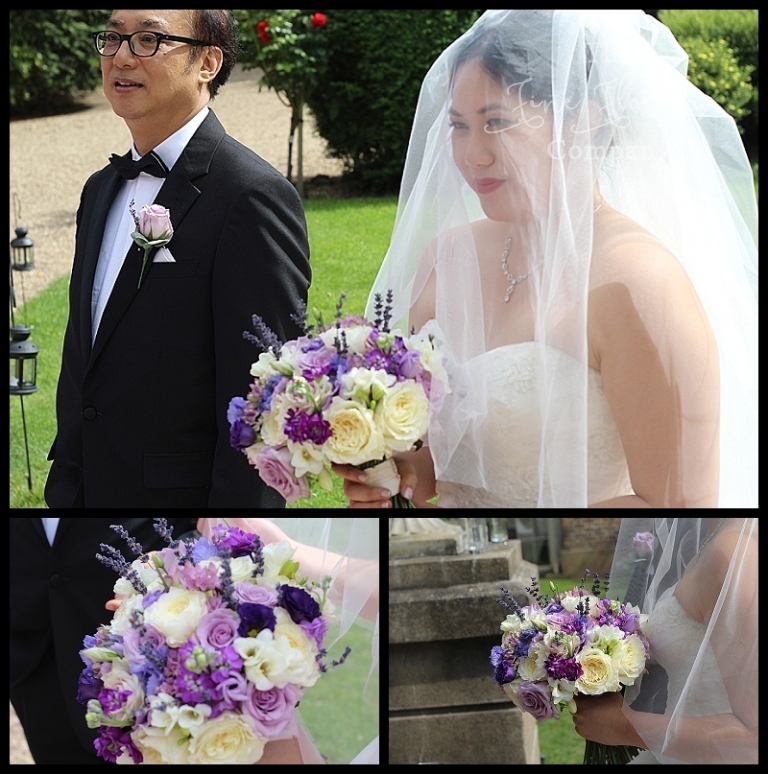 The bridal and bridesmaids bouquets all used a lovely mix of ivory roses and David Austin Patience roses, scented freesias and palest lilac Pacific Blue roses, lilac lisianthus, scabios and scented lavender sprigs. 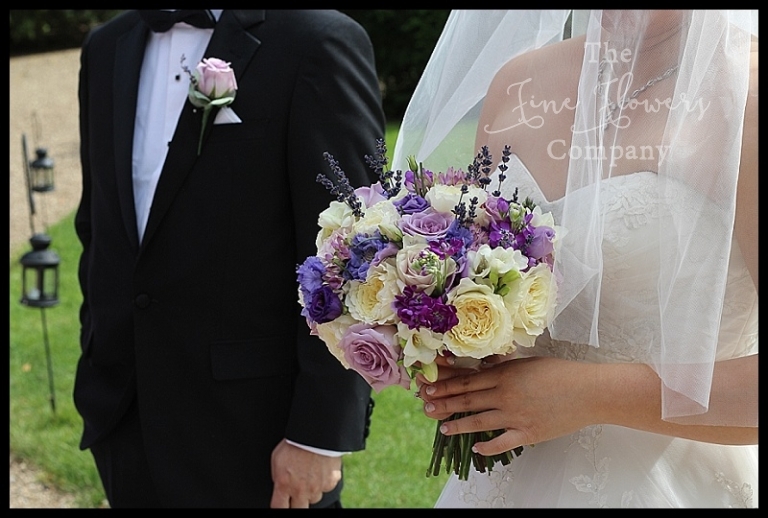 The men’s buttonholes of lilac Pacific Blue roses, with sprigs of lavender echoed the designs of the bouquets. For the ceremony room, the aisle and the ceremony area were dressed with our super tall, super lovely, super romantic flower trees (on hire), personalised with hanging lanterns and Kim & Anthony’s childhood pictures in pretty vintage frames. The trees were later on put to good use – two were used to frame the grand door to the great theatre hall, three on the stage itself, and one on the guests comments cards table. Leading the guests path to the champagne reception, the stairs were decorated with lavender posies in rustic hessian wrapped jars and tall pillar candles in storm vases. The guest tables were dressed with a mix of tall and low centrepieces. The tall ones were big puffballs of dreamy gypsophila, punctuated by pretty and delicate lilac scabios flowers, and defined by lilac and purple hydrangeas. The low centrepieces were clusters of tall stemmed glass tea light holders, and lavender shrouded vases with candles in them, and a pretty central cluster of flowers above everything else. And finally, the beautiful cake, created by Serena at Pearl & Groove Bakery, was decorated with David Austin roses. Boasting one layer of raspberry white chocolate, one layer of Earl Gray, one layer of zesty lemon and one layer of salted caramel, and giving off lovely chocolate aromas, it was a little bit too tempting, so I had to walk away swiftly! 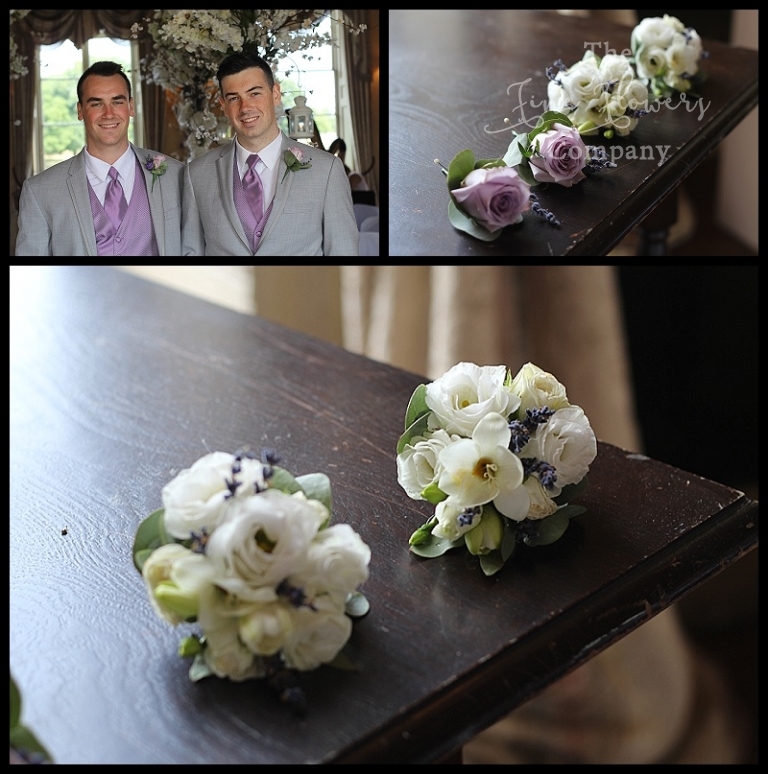 Here are some more tempting photographic morsels from this amazing wedding at Hampton Court House. If you like what you see, and are planning your own wedding at Hampton Court House, please take a look at our Hampton Court House wedding venue pages for other featured Hampton Court House wedding flowers, for lots and lots more inspiration. We are very familiar with this lovely venue and can offer plenty of advice on how to dress it beautifully for your wedding, whatever style and colour scheme you may be planning.